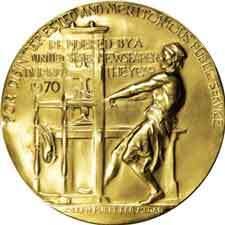 Steve Myers, of Poynter, researched these winners for his piece on Why it matters who won the first ‘online’ Pulitzer? Interesting how he breaks down the nature of the work. – Did it appear first in print or online? – Was it created for the web or for print? – How do print and web stories mesh to form one narrative? Print-native news outlet, mostly print-native work. Four of the 20 works in the Times-Picayune’s entry for its Katrina coverage can be considered online-focused. If you want to be strict, you could argue that just one, the news blog, was digitally native. Print-native news outlet, combination of print and digitally native work. The Sun Herald’s entry for its Katrina coverage also was heavy on stories, but it included an extensive description of its online work: a news blog, frequent home page updates, photo galleries of damage (by its own photographers and from readers), forums that people used to get in touch with one another, and an interactive map of damaged areas. News stories comprised the bulk of the Post’s entry for its coverage of the Virginia Tech shooting, but the Post also included a description of how it had developed its online coverage throughout the day. It started with an initial, one-line report of a gunman on campus and later included stories with fatality counts, an audio report, live Internet radio, cell phone videos and user submissions. Print-native news outlet, mix of print and digitally native work. Read the complete list at Poynter.